The last weekend of October just gone 28th/29th/30th October 2011 was the biannual Canberra Way We Wear Fair vintage fashion weekend--Fri night--Sat & Sun. I always enjoy the positive feel of the Canberra crowd--they are fun, relaxed, courteous and really adore their vintage! There are not as many outlets in Canberra for either buying and wearing vintage so many feel they can come to this fair and soak it up. The wonderful displays that Fiona and Keith do are also a major attraction. This time it focussed on the Titanic era and clothing/accessories worn at that time. I have to say though in great admiration again, the young crowd don't fear the wrath of conformity and wear vintage in the bold exuberance that comes with this "can-do/will-do" time in your life--I hope they continue on this path through their years. 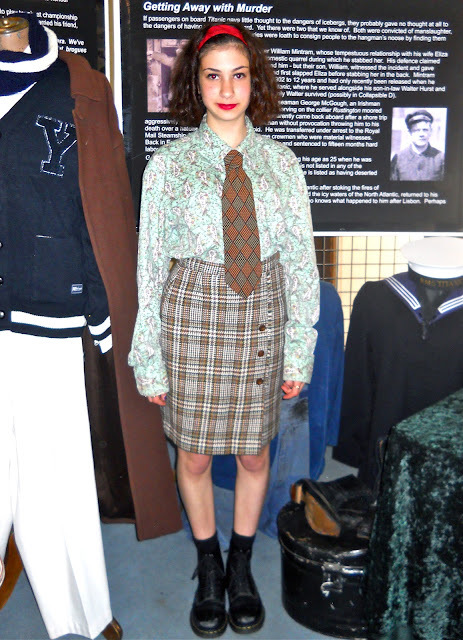 Below are photos of a young girl in year 10 who came with her friends all dressed creatively in vintage. Mixing eras and styles is their trick that brings their look into an ethereal timeless space. This outfit shows a 50s straight skirt, a 70s paisley oversize blouse, 70s tie, black socks with 90s Docs. The bright red headband and lipstick focus her pretty face and the look has pizazz as well as an element of country prep. I can't get enough of this girl's look! GRAND DESIGNS LIVE AUST. Another successful event. This past weekend Mitchell Road Antique & Design Centre were fortunate enough to secure a display space at the very first Grand Designs Live Australia expo. Emma and I were kept busy talking to people all day and night Friday, and all day Saturday & Sunday. We were both not only impressed and pleased with the immense and positive response from the public to Grand Designs, but particularly excited by the same positive public response to our display and to the Antique and Design Centre. Mitchell Road is a massive warehouse space that sells iconic and useful items that fit into the theme of Grand Designs--ie making YOUR personal space grand and unique whilst remaining mindful of excessive use of new resources. Below is a handsome 60s era Chiswell brand sideboard with glass shelf display full of art glass, cats and bulls, and pottery. Thousands of people were able to see what the Antique and Design Centre stands for, namely prolonging the life of the myriad of amazing items from the past and giving them a new, stylish and respectful future. They were also able to pick up an information leaflet with vouchers for 15% off their next purchase and a free coffee and cake at the weekend coffee shop. Below is one of the ever popular Barsony red flamenco dancer lady lamp with original 50s shade. I am always proud to say these stylish world renowned lamps were made by an Australian (George Barsony). The Tretchikoff print is another iconic and stylish 60s decor item in great demand. Maps and map items are increasing in popularity. These look fabulous both in an industrial theme or a general retro one. We also used the opportunity to meet some lovely new people in similar areas. Jason Mowen sources incredibly stylish, unique and beautiful vintage and art items to give you a choice for your decor that you know will not be replicated. Old School Industries completely revamps old unloved discarded pieces of furniture into sensational decor. Emma and I were lucky enough at the end to get a photo taken with the main man himself--Kevin McCloud! ---which I won't share with you due to it not turning out as great as I was hoping! However our prize taxidermy rooster sure turned out great as he watched over the packing up! Well, the Love Vintage Clothing Show and Sale Sydney was another successful weekend just this weekend gone. It has been enthusiastically taken over by another organiser and the results of their prolific advertising was seen in the greater numbers of people at the fair. As usual it was exciting and inspirational seeing the lengths people will go to to dress in vintage--by this I don't necessarily mean perfect era replication although these are amazing as well, but there are so many others who are creative on another level--whether it is quirky and over the top or simply mixing it up with modern clothing. Here is a picture of Dee. She is famous throughout all the Sydney vintage markets and fairs and her creativity and boldness is second to none. She is a fabric dye specialist and uses this knowledge to work magic with the many things she buys. Her eye for the different never to be used as is, is mind blowing! I am also always especially amazed at the youngest generation and their boldness and good taste they have with vintage. I was fortunate enough to have a representative of this enthusiastic younger generation as a helper for Friday night and Saturday. At 16 years of age this young girl impressed me with her keenness about vintage and her excellent taste in dress. She managed to wear 1980s with great style and individuality for herself. She was fantastic with customers--ever helpful and courteous. I felt very lucky. Here is a picture of Sofia. Mitchell Road Antique & Design Centre is embarking on many new ventures--one of them is advertising. It took some thinking and organising but we eventually got a brilliant photographer, model, stylist and hair/makeup person to come over a Saturday not so long ago for some incredibly creative shots. I was overwhelmed watching this bunch work away and develop the dream that Lyn, I and some others had about the way we wanted to represent the place. I just knew that someone would be able to transpose this item prolific and very cool place into enticing creative dressing, decor and photography which has now become captivating advertising. Thank you Carine, Jodee, Dannie, Vanessa and Anton. Watch out for our first ad in the Love Vintage Fashion Show and Sale program this weekend! It's already downloadable from the front web page as pdf! "SET YOUR OWN TRENDS"--Graffiti Wall. at Mitchell Road Antique & Design Centre. Well, I never thought that graffiti was ever a great thing but I have to say when Lyn Richardson, the owner of Mitchell Road Antique and Design Centre, put it to us that that was what she wanted to do for the famous yellow walls of the place, I thought, why not! It's eye catching, colourful, bold and certainly reflects the philosophy of the place that we are not your usual antique centre, nor if you shop here will you be the same old person when you walk out! We were fortunate to hire Dean who took a painstaking 5 days on the job and had to deal with rain and wind to get it finished--yes, Sydney has been wet and cold for the middle of spring! The result I think looks fabulous, although the pinup girl's mouth area can look distorted as you drive towards it along Mitchell Road as it's painted on a small backward ledge. What do you all think? Anyway, here's hoping this will attract more people to the place that is Sydney's best kept secret...... .....thus far! !